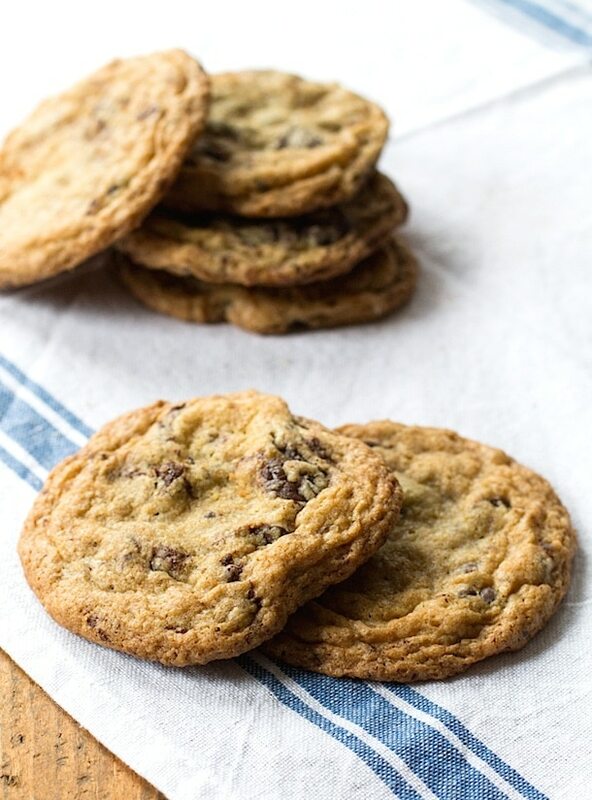 It’s taken me a long time to nail down the cookies you see here partly because I always spot a new recipe that immediately has me reaching for the baking sheet. I do a little tweaking to make them gluten-free if needed and all is right in the world. I’ve made these classics from Sarah, walnut studded beauties from Joy, a honey laden version, and chewy, brown butter ones (already gf) from Alanna. I’ve learned that most regular cookie recipes can be a decent gluten-free success if you substitute a good gluten-free flour blend for the all-purpose flour by weight, NOT the cup measurement. But, if you want amazing gluten-free chocolate chip cookies, a little more attention to detail with process & ingredients is needed. And I stand firmly behind putting a little more effort into it. Think gloriously crisp & buttery edges, slightly sunken and chewy middles, and the perfect ratio of chocolate to batter. It makes me want to shriek every time I take my first bite, still warm and a little underbaked. Although this might be a little lengthy, I wanted to share with you the extra details I’ve learned over the course of gluten-free cookie baking. I want to set you up for success! So let’s get started. The way to make sure a recipe turns out the same every single time, no matter if you’re baking gluten-free or not is to measure by weight. Since we all scoop, spoon, pack and pour differently, my 1 cup flour may be 120 grams and yours 145. With the science that happens when you cook, that can make a big difference. Invest in an affordable digital scale, it’s well worth it. Cup4Cup Flour has proven time and time again to me that it is the best gluten-free flour blend on the market. There really isn’t anything that compares. It has no grittiness, a soft crumb, stability and consistency. It does contain cornstarch, xanthum gum and milk powder which some people can’t tolerate . In that case, I highly recommend the allergen friendly Bubble Girl Bakes Gluten-Free Flour. I’ve used it in this recipe and adjusted for the binding power of the other ingredients by adding 3 tablespoons of sweet rice flour and chilling the dough for an hour instead of 30 minutes. You’ll get great results, just a thinner, flatter cookie. It’s important to bring your cold ingredients to room temperature before starting the cookie making process – the butter, egg and your gluten-free flour (which should always be stored in the refrigerator to keep it from going rancid). Why? Because at room temperature the eggs and butter form an emulsion that traps air. During baking, the air expands, producing light, airy, evenly baked treats. Always chunks over chocolate chips. (I know the title says chips, but that’s just because that’s what most people call them.) Not the chunks that come pre-cut in a bag, but the type you chop up yourself using the best quality chocolate bars your sweet tooth can afford. Not only will the chunks distribute more evenly throughout the cookie, but the shards from chopping will disperse throughout the batter. 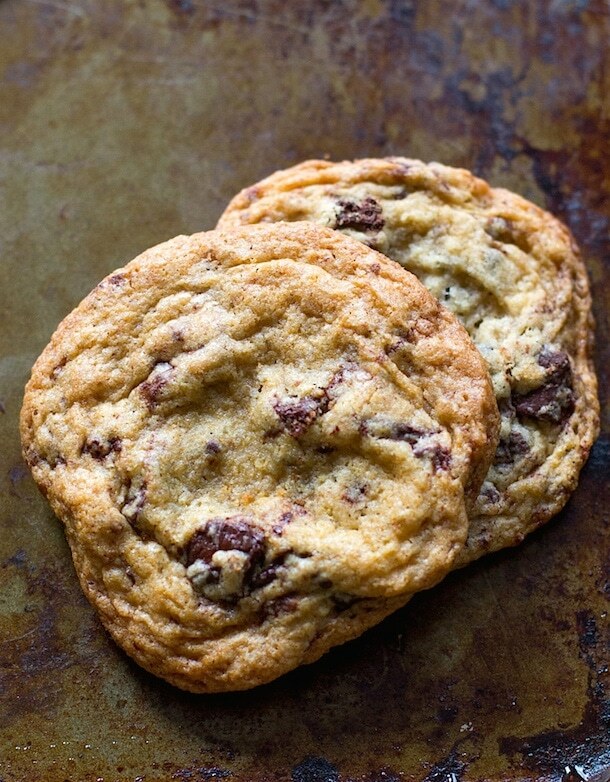 And one more vote for chunks – chocolate chips hold their shape due to less cocoa butter, while the latter melt into gooey chocolate decadence. I battled with this one a lot. I love chocolate and nuts together. I like the texture they bring to cookies and their toasted flavor. But I decided that chocolate chunks deserved to shine alone in this cookie. Plus, I wouldn’t have any noses turn up when I had to tell the people who hate nuts in brownies that these cookies contained them too. Instead I got the best of both worlds by using this toasty, pure walnut extract that my friend Vangie of Meso Nutso makes. She does it all herself and the quality & care is evident. She uses triple distilled vodka, local Oregon walnuts and bourbon to make this particular extract. I know beautiful is not the right descriptor to describe aroma, but it’s true in this case. I tested this recipe with several different chilling times, from none at all to 2 days. The winner? 30 minutes. With no chill time they spread too thin and don’t get that nice rippled effect. Bake them straight from the refrigerator after a night of resting and they don’t spread enough. Result: mini hockey pucks. Both still tasted great, but not quite the texture I desired. Okay…… I think you’re ready. 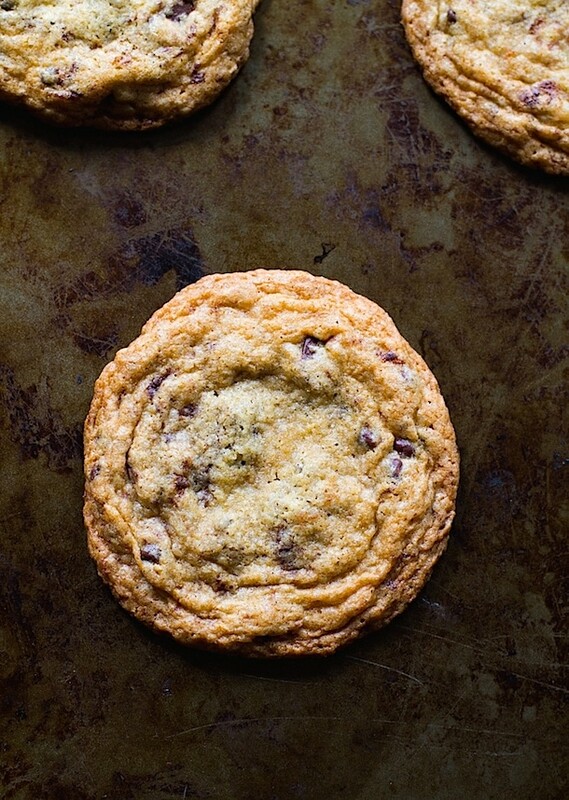 You’ve got all the details for gluten-free chocolate chip cookie success. Ones that you’ll eat too many of the first time you make them and ones that nobody will know they’ve got the “gf” word attached to them. Now all you need is a sweet tooth like mine and glass of milk for dunkin’. Go forth and bake! In a bowl, stir together flour, baking soda and salt. Set aside. In another bowl, stir together sugars and maple syrup so that no lumps remain. Set aside. In a mixing bowl, beat butter on medium speed until mayonnaise consistency, about 1½ minutes. Add sugar mixture and beat for 1½ minutes on medium speed, scrape down sides, then beat for another 1½ minutes so the mixture is light and fluffy. Add egg and walnut extract, incorporate on low speed for 20 seconds. Then incorporate flour mixture in 3 additions, until batter just comes together and no flour streaks are present. Stir in chocolate with spoon. Refrigerate for 30 minutes. Meanwhile, preheat oven to 350 degrees. After batter has chilled, make cookie dough balls that are a scant 2 tablespoons of batter. Bake 8 cookies per sheet for about 12 minutes. They should look a little underbaked in the middle, starting to brown on the outside. And thank you for understanding that I carefully choose the brands I work with that help make this site possible. All opinions are 100% my own. This post contains affiliate links, which I make a small amount of money from should you purchase something. These look above and beyond! I cannot wait to whip up a batch this weekend! And thanks so much for the Bubble love! Love your recipes Amanda! Miss u! ah, so great to hear from you Judy! hope all is well with the family. I love how thorough your discussion of gluten-free baking was. As someone who is learning to navigate her way through gf baking (which I prefer for many reasons, a lot of which actually have to do with taste and texture! ), this was super helpful. Thank you! I’m glad you found the tips for gluten-free baking helpful Ksenia! It’s definitely a journey, and I think I’ll always be learning. So happy you stopped by – I love your site! 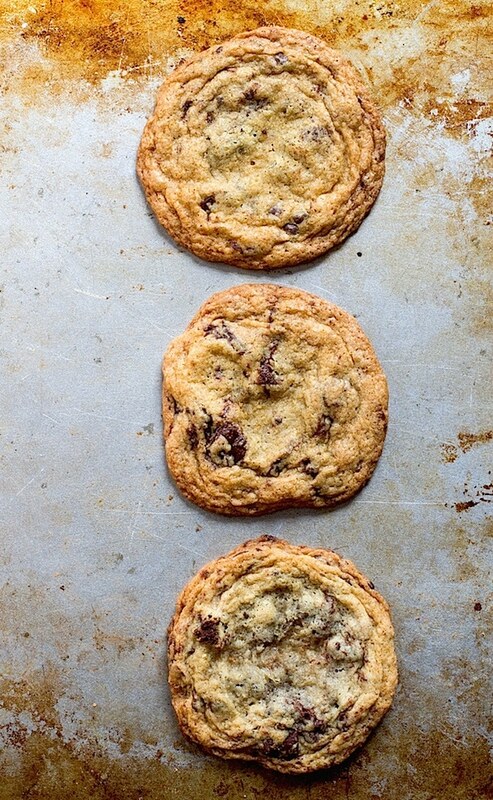 Hurrah for chocolate chip cookies! These look absolutely perfect and I can’t wait to give this recipe a try. These look so delicious, Amanda! I love that they have a crisp edge and soft center – and that walnut extract looks divine! What a creative way to get the nutty taste without using actual nuts. I’ll definitely be trying these! these look fantastic! Also appreciate all of your tips. You’ve done the hard work for us :-) Glad to hear we share a sweet tooth. Yes, I’ve never been able to get away from my sweet tooth Liz :) thanks for stopping by! Jaclyn, hope you enjoy them! A fun way to break in that new baking set of yours :) I’m going to send you an email this week, was so nice to connect on Friday! where is the “print” button…..? I just discovered your blog and everything you do is amazing. My brother-in-law is celiac and I can’t wait to try these for him. Thanks so much for sharing with us! Thanks for the kind words! Glad to have you here and just hopped over to your blog as well. Fun to connect! Nice post. Very thorough. Good tips whether you’re gluten-free or not. I haven’t purchased a scale yet but am getting closer…just need to find space in my kitchen! thanks laurie! my scale is just a round little thing, smaller than a 9inch cake pan. so worth it! These are amazing! I’ll call them “the best” if you won’t! Hi Kate! I’m glad all the specifics helped, even though a little lengthy :) Sometimes you just need to include all of those little tidbits to make sure they turn out well. Thanks for letting me know you made them! I don’t need to bake gluten free, but it’s nice to have a recipe like this on hand just in case :) Pinned! GF cookie. I am tired of spending a lot of $$ on baking items that are just so-so, or worse. The only problem is that they taste so good there is only a couple left! Do I have time to bake more before Xmas! Thanks for a great recipe and instructions. Merry Christmas! Can I substitute the butter with palm shortening and use egg replacer (energy powder)? Also will need to use a different blend of gf flour like king arthur. My son has a dairy, egg and flax and chia seed allergy amongst others. Cannot seem to get a good chocolate chip recipe down. Any advice would be great. Hi Christine! I haven’t tested those substitutions, but I don’t think energy powder work to replace the egg. I wouldn’t recommend trying it that way. I don’t have experience will all of those allergies so sorry I can’t be of more help! I hope you can find a recipe that suits his needs. I don’t own a scale. Can someone tell me what the conversion is for the flour? Hi Heather! The measurement would be about 1 1/2 cups, but I can’t guarantee that they will turn out exactly like you see. Make sure you measure by spooning the flour into the cup, not dipping it into the flour and leveling it off. This is the closest to get to the accuracy of the weight measurement without having a scale. If you’re going to be doing a lot of baking, gluten-free or not, I highly recommend getting an inexpensive kitchen scale. It’s amazing how people measure differently, so having a scale will make sure that it is correct according to the recipe and you’ll be successful. Hope that helps! 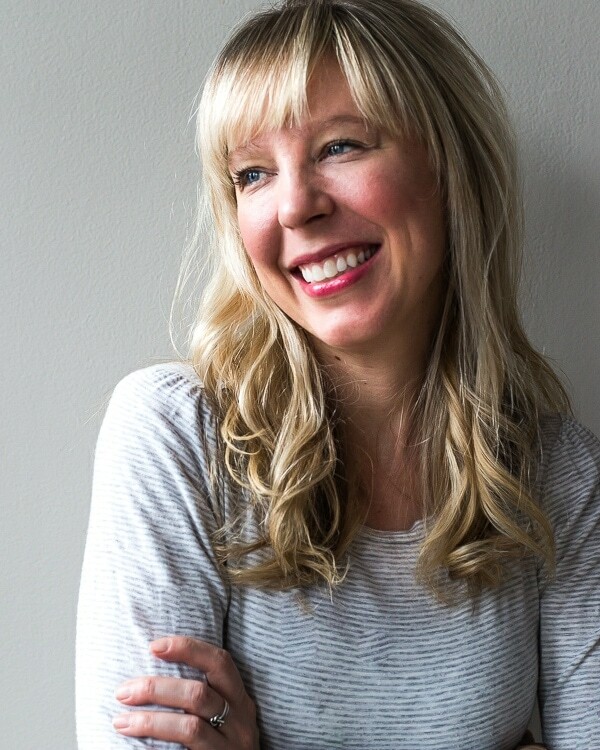 Hi Amanda, I don’t have any noticeable issues with gluten, however I have recently learned that none of us should eat gluten (including GF oats) as it destroys the villi in the small intestines, which are responsible for absorbing our nutrition. The popular saying going around is “You are what you eat”, however it is really “You are what you absorb”. Some people don’t realize they are gluten intolerant until they go off gluten for 2 to 3 weeks, are feeling really good, eat a bunch the next day and then feel crappy. There are about 20% of the population that don’t have a problem with gluten. So, I am trying to find recipes that are GF. These cookies look yummy, I’m going to make some today. Do you have any substitution suggestions for recipes that call for oats? thank you! nothing better than warm chocolate chip cookies right? Hi Amanda, any ideas on how to substitute sugar and brown sugar? So, I’ve made a few GF cookies before which still taste delicious… BUT OH MY GOODNESS, these cookies are the awesome. I used vanilla in lieu of walnut and just used some mini chocolate chips. I just ate two, right out the oven and I had to walk away to stop myself for eating all of them. They are so good! I can’t wait until my husband gets home (who isn’t GF) to try these. Knowing him, he will rave about these! If you are hesitant, just make these, please! You will not be disappointed. Oh, and I just weighed everything as well, though that’s not the norm here in the U.S. These look amazing and I’ll be trying them tomorrow as I think I have all ingredients on hand! 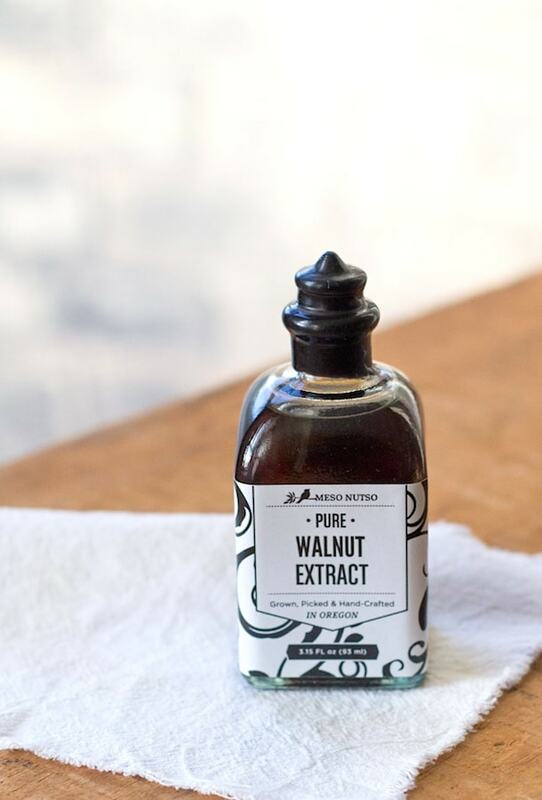 One question: if I were using walnuts instead of walnut extract, how many would I add? Hi Becky! Many people have made these and loved them so hoping you do too :) Since walnuts take up a lot more of the dough, I would only add 1/3 cup chopped walnuts, and reduce the chocolate by 1/4 cup. Enjoy! I’m so glad someone else likes to know as much about how a recipe came to life as much as I do. Enjoy! Thanks so much for getting back to me about the walnuts! I ended up trying the recipe today without the walnuts referred to in my comment above and with the vanilla extract instead of the walnut extract. I also used America’s test kitchen GF flour blend with added xanthan gum to try to replicate what is in cup 4 cup (potato and tapioca starch instead of cornstarch, white rice flour, brown rice flour, nonfat milk powder). I kinda hate it when people comment about recipes when they’ve made a bunch of changes; that being said, even WITH all of the changes, this was a PHENOMENAL chocolate chip (chunk) cookie! My picky husband licked his plate (and I couldn’t help myself but to lick mine, too!). We both thought that the cookies looked like the cookies in the book “If You Give A Mouse A Cookie.” Perfectly sweet and bitter. I can’t wait to try the recipe with added walnuts/subtracted chocolate. I froze the pre-formed dough and I’m hoping that I will have good results. Any experience on that? I had to do that in order to avoid sitting down and eating them all…they really are just that good. Thanks for sharing your recipe with us! You can definitely freeze the pre-formed dough, you should just let the dough balls sit on the cookie sheet for 10 minutes before baking, and then just watch their doneness. Have a great rest of the week! My mother and sister both have celiac and I am the baker/cook in the house. I made used this recipe about 4 months ago and everyone was blown away. I sent my boyfriend some in a care package and didn’t tell him they were gluten free… he said they were the best chocolate chip cookies he has ever had. I just re discovered this pin after looking for it for months. I am making them today and am going to feature them on my new (work in progress) blog. Should have it up by tomorrow. Hi Amanda. I made your cookies tonite. I bought a digital scale and measured everything exactly as listed. Thanks for all the info. I appreciate knowing how and why things work. I used Namaste gf flour blend because I had it. My cookies came out thick and not crunchy. Any ideas as to why? They’re still good but I love a thin, crunchy cookie. Hi Linda! The reason why I like Cup 4 Cup Flour so well is that it produces a texture and results just like regular flour because of their blend. Namaste has a high portion of Sweet brown rice flour compared to the gf grains in it, which is a “stickier” and “gummier” flour which will cause them to inhibit spreading. It is helpful in gluten-free baking because the stickiness helps to bind, but in a gluten-free cookie it will cause less spreading and crisping. I would highly recommend trying Cup4Cup even though it is more expensive. Because it has cornstarch and potato starch in it, you will get a crisper edge, yet softer middle. It uses a more even blend of flours and it’s amazing! Thanks, Amanda. I’m going to look for the cup4cup flour the next time a head to the supermarket. Thanks for all your help and explanations! Hi Taylor! It could possibly be that your oven is calibrated a little low. I use an oven thermometer. If the temperature reads 350 but might actually only be 335 inside, they will not spread as much. Another option would be to use about 25 grams less flour next time. I haven’t tested them with coconut oil so not sure if that would work. Hi Amanda! My cookies aré in the oven right now so I hope I get a good result. I have reently started to bake with coconut oil instead id butter. What would the conversion be? I also used bobs red mill flour.. I used the same amount of flour as your recipe but added xanthan gum. How long should I leave the dough chilling after the 30 min fridge? I tried these today but they turned out a bit odd. The cookie, though delicious, was rather dry. I’m not sure how to describe it. It was almost like powder on the inside. Strange, right? I followed the instructions and am thinking of trying the recipe again. Any idea of what might have gone wrong? Hi Sarah! Did you use Cup4Cup Flour and measure by weight? I did. I used my mom’s scale though, which is quite old. We kind of rounded up. I presume that was the problem? I bake a lot and while I don’t have celiac, I recently discovered, I feel a lot better not eating gluten. I just made your cookies. I used the GF Flour Blend from The Healthy Maven. Also, I used cane sugar for the white sugar and coconut palm sugar for the brown. I don’t usually experiment the first make with a recipe, but in this case it worked. Thanks for all the detail and just thought I’d share my experience with the sugars. Great! So glad you liked them Laurie. And appreciate you sharing your experience with the other sugars. Hi, can I make those cookies with the new Cup 4 Cup Wholesome flour blend?? I just bought a bag and was wondering if it would work. Thank you! I’m looking forward to making these for my whole family, but especially my 6 year old daughter who has celiac disease. Any suggestions for a substitution for the maple syrup? I don’t have pure maple syrup (we have the imitation stuff), and live a good 1/2 hour from a grocery store. Hi! You could also use honey. If you don’t have, I would add an extra tablespoon of butter. Hope you enjoy! Hi Amanda – My boyfriend and I made these cookies on Saturday night and my oh my where they heavenly. I’ve been looking for that go to cookie recipe and now I’ve found it!!! They were DELICIOUS. We made ice cream sandwiches with them too! One note, I used earth balance dairy free butter and they came out super duper. Happy baking everyone! Yay Sarah! This makes my day. And reminds me that I need to make another batch. :) So glad you loved the recipe, and quite brilliant to make ice cream sandwiches with them. Good note on the earth balance too, thanks for letting others know! Hi! I’m in process of making these now and it seems that my scale is incorrect (even thought it’s brand new). 205 g of flour is just over 1.5 cups however on my scale (I checked over 3 times)….205 g is well over 2 cups of flour. Same thing is happening with all my other ingredients. I’m not sure what is going on? Hi Aga! Yes, I think your scale must be off and not calibrated correctly even though it is new, especially since all of your ingredients are not measuring correctly. You are correct in that 205 grams of the flour should be 1 1/2 cups. Did you put your bowl or whatever you’re measuring the flour into, on the scale first then reset the scale to “0”? My scale I can put the bowl on, push off/on and the scale resets to 0 with the bowl on it. I think that may be the problem. I just baked these delicious cookies. I don’t favour the taste of very sweet desserts so I cut the sugar out by 1/4 cup. The taste and texture is amazing! Will be making again! I used Bob Mill’s 1-1 gluten free baking flour. Thanks for an incredible recipe! Hi Cheridal! I’m so glad you liked the recipe. I think the problem may have come in the chilling/rewarming/chilling phases they went through and the fact that you let them warm up, which is what would make the fats have less structure. Therefore they will spread too much. Once you’ve done that, you can’t really go backwards. Next time just chill, and pull right out of refrigerator into the oven. I have made half a batch, then refrigerated the dough and baked the rest the next day without a problem. Hope that helps! Thanks for your quick reply! I figured it was because of letting the dough warm up just a bit first. I’ll know better next time. So for the half batch, did you beat the egg then weigh out 60 grams? And I read in one of the replies that you can freeze the balls, let them warm a bit then bake? I’ll probably try that if that works!! Thanks again – I really was thinking I couldn’t get a good cookie again! BTW – I didn’t tell you in the first one but I don’t like Maple with cc cookies so I left it out but used another t of vanilla. Also, to make them just a bit crispier I tried a little exchange of cornstarch for Cup-4-Cup in the next batch & I was surprised how well it worked! I’ll continue with my experimenting and enjoying this recipe!! These are the best! Followed all of the directions to a T! They turned out beautifully and found the flour at Target:) Thank you for the great description of the ingredients too! terrific – i’m so glad you enjoyed them! and great to know that Target now has Cup4Cup Flour. HI! How much flour does that translate into in terms of cups? No scale here! Hi! It is a scant 1 1/2 cups, but I can’t guarantee that they will turn out the same, because a scale is so important in gf baking. We all scoop and measure differently, so it is important to use a scale. Make sure you scoop the flour out with a spoons and put into the measure cups, not scoop the cup into the bag. WOW. This was my first time making gluten-free cookies and I am so lucky that this was the first recipe I tried. They came out perfectly and I owe it to your careful instructions and ingredient choices. Thank you so much!